I hope all is forgiven...I have but ONE baby and will only ever have this one baby. So you get her first year of life condensed in 13 photos - up to the professional photo shoot on exactly her First Birthday! Just in case you are wondering - she is now 5 and a half. Those cheeks! OMG I want to squish them. She looks so much like you! I love that Halloween pic where she's sporting 2 teeth. So cute! Oh so sweet! What a happy girl. 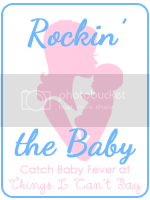 I'm loving this Rockin' The Baby link up - love seeing everyone's babes! So cute! She appears to be a very happy baby. Yeah! So glad it works. I want to go back in time and pinch those cheeks :) what a beautiful tribute to boo!! !